Implementation of a inverse velocity kinematics algorithm based on the weighted pseudo inverse with damped least-square to calculate the velocity transformation from Cartesian to joint space of a general KDL::Chain. It uses a svd-calculation based on householders rotations. Mq and Mx represent, respectively, the joint-space and task-space weighting matrices. Please refer to the documentation of setWeightJS(const Eigen::MatrixXd& Mq) and setWeightTS(const Eigen::MatrixXd& Mx) for details on the effects of these matrices. For more details on Weighted Pseudo Inverse, see : 1) [Ben Israel 03] A. Ben Israel & T.N.E. Greville. Generalized Inverses : Theory and Applications, second edition. Springer, 2003. ISBN 0-387-00293-6. 2) [Doty 93] K. L. Doty, C. Melchiorri & C. Boniveto. A theory of generalized inverses applied to Robotics. The International Journal of Robotics Research, vol. 12, no. 1, pages 1-19, february 1993. Definition at line 63 of file chainiksolvervel_wdls.hpp. Definition at line 28 of file chainiksolvervel_wdls.cpp. Definition at line 72 of file chainiksolvervel_wdls.cpp. Definition at line 116 of file chainiksolvervel_wdls.cpp. Definition at line 105 of file chainiksolvervel_wdls.hpp. Definition at line 193 of file chainiksolvervel_wdls.hpp. Definition at line 198 of file chainiksolvervel_wdls.hpp. Definition at line 204 of file chainiksolvervel_wdls.hpp. Definition at line 178 of file chainiksolvervel_wdls.hpp. 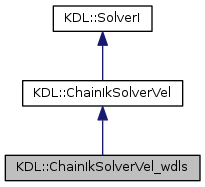 Definition at line 108 of file chainiksolvervel_wdls.cpp. Definition at line 183 of file chainiksolvervel_wdls.hpp. Definition at line 210 of file chainiksolvervel_wdls.hpp. Definition at line 98 of file chainiksolvervel_wdls.cpp. Definition at line 93 of file chainiksolvervel_wdls.cpp. Definition at line 103 of file chainiksolvervel_wdls.cpp. Definition at line 76 of file chainiksolvervel_wdls.cpp. Definition at line 86 of file chainiksolvervel_wdls.cpp. Definition at line 218 of file chainiksolvervel_wdls.cpp. Definition at line 54 of file chainiksolvervel_wdls.cpp. Definition at line 219 of file chainiksolvervel_wdls.hpp. Definition at line 67 of file chainiksolvervel_wdls.hpp. Definition at line 226 of file chainiksolvervel_wdls.hpp. Definition at line 222 of file chainiksolvervel_wdls.hpp. Definition at line 220 of file chainiksolvervel_wdls.hpp. Definition at line 236 of file chainiksolvervel_wdls.hpp. Definition at line 237 of file chainiksolvervel_wdls.hpp. Definition at line 227 of file chainiksolvervel_wdls.hpp. Definition at line 221 of file chainiksolvervel_wdls.hpp. Definition at line 238 of file chainiksolvervel_wdls.hpp. Definition at line 224 of file chainiksolvervel_wdls.hpp. Definition at line 240 of file chainiksolvervel_wdls.hpp. Definition at line 239 of file chainiksolvervel_wdls.hpp. Definition at line 228 of file chainiksolvervel_wdls.hpp. Definition at line 229 of file chainiksolvervel_wdls.hpp. Definition at line 230 of file chainiksolvervel_wdls.hpp. Definition at line 231 of file chainiksolvervel_wdls.hpp. Definition at line 233 of file chainiksolvervel_wdls.hpp. Definition at line 232 of file chainiksolvervel_wdls.hpp. Definition at line 223 of file chainiksolvervel_wdls.hpp. Definition at line 225 of file chainiksolvervel_wdls.hpp. Definition at line 235 of file chainiksolvervel_wdls.hpp. Definition at line 234 of file chainiksolvervel_wdls.hpp.